Property owners, investors, and renters looking for a good quality location at a good price would do well to consider the Covent Garden located in London. This area is close enough to the trendy Mayfair area and the theatre district in the West End of London. Renters can rest assured that they will not have to pay the higher prices afforded to residents of Mayfair as Covent Garden rental property values are akin to that of Soho. There are many West End estate agents with properties available, so renters will have a decent selection to choice for their property, living condition, and rental, permanent or temporary residence. They will also enjoy the cultural aspects of the area such as the opera and the convenience of the market. 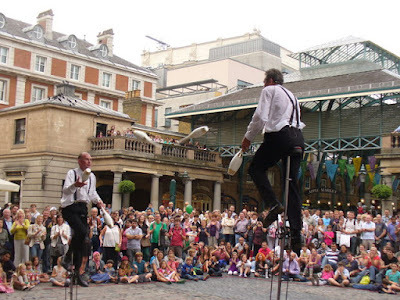 Seven Dials is a wonderful shopping haven which covers a seven block radius of Covent Garden. Here you can enjoy the ultimate shopping delights such as the most exclusive boutiques, hotels, cafes, theatres and so much more. Informed business people will want a piece of this financial treasure trove. Renters will enjoy having their flats so close to the hub. The area is pretty ease to access by bus, tube, train, and Heathrow Airport. Seven Dials is a road conjunction where seven roads converge. At the center of the road conjunction is the Seven Dials sundial pillar. The pillar has six sundials to commemorate what was believed to be the first street plans for the district. It was believed that only six roads were to be included in the original village plan and therefore the reason for the six faces on the dial. The original monument stood at the base of the converging streets, but was taken down and relocated to Weybridge to honour the daughter of King Frederick William II of Prussia. The locals in the area refer to the whole seven street radius as Seven Dials. This area goes as far north as Shaftesbury Street, south as far as Shelton Street, east as far as Endell Street and west as far as West Street. Since it is only seven streets you can walk it in less than five minutes. This tiny location is in great demand for entrepreneurs. Shoppers can enjoy the busy retail area, and retailers, compete for this prime location. Though business people may not want to shop at their midday break, if they have a commercial establishment in the area, they will reap the benefits of hungry shoppers. Businesspeople can entertain their clients in true British style. There are many celebrated French restaurants in London. The theatre productions are always a favourite. International clients will get a taste of British hospitality. Directions to the area are simple. The Seven Dials sub district of Covent Garden is just minutes away from the Covent Garden tube or bus lines. The locals will also help with directions if necessary. Seven Dials and Covent Garden is preparing for the Queen Elizabeth’s diamond jubilee. British patronage will shine throughout the district with flags flying and celebrations galore. There will also be street entertainment and special dishes prepared in her honour. Londoners and visitors alike will have a good time. Would you like to search for West End Flats for rent? You can learn more about how to do that and the ways to rent in this area quickly for your preferred home by visiting LDG's website for more information on properties.